The lights went down and all was silence. In the partially covered pit the conductor was invisible but slowly a quiet E flat emerged. Daniel Barenboim’s restrained conducting allowed huge clarity for the singers and plenty of scope for the brass at big moments. It was a coolly intriguing prelude to The Ring. The stage was filled with water, albeit shallow, and Alberich and the Rheinmaidens were like a boy with three teasing girls splashing around in the water. After their mockery he is defeated and soaking wet. Then comes the gold motif and we’re off and away. After Alberich takes the gold, dancers enter. They form everything from an arch for the entrance of Wotan and Fricka, to a throne for Alberich and an animated tarnhelm. They also writhe and express themselves to the music, but not everyone will like this aspect. Some of us prefer less distraction. It seems that the director, Guy Cassiers is keen to see perpetual motion on stage, whereas many in the Wagner audience are doubtless more keen to listen to the orchestral sound and the singers. In this respect there was some very fine singing indeed. 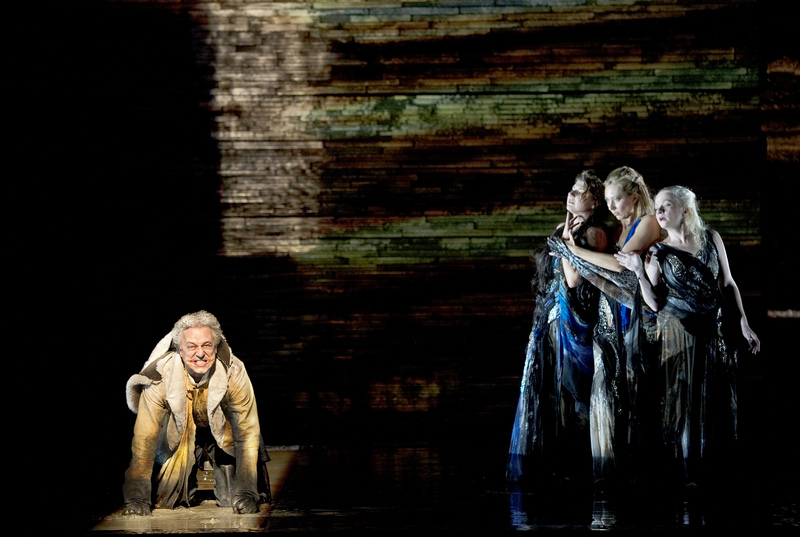 Johannes Martin Kränzle was a terrific Alberich, somewhat hampered by the dancers in this opera, and I look forward to his return in Siegfried and Götterdämmerung. Superb diction and tone from Iain Paterson and Mikhail Petrenko as Fasolt and Fafner, plus a very strong vocal presence by Stephan Rügamer as Loge, and mellow attractiveness from Ekaterina Gubanova as Fricka. Despite a subdued performance as Wotan, René Pape came through strongly when necessary, particularly after taking the Ring from Alberich when he gloats that his new possession will raise him to der Mächtigen mächtigsten Herrn (the mightiest of mighty lords). 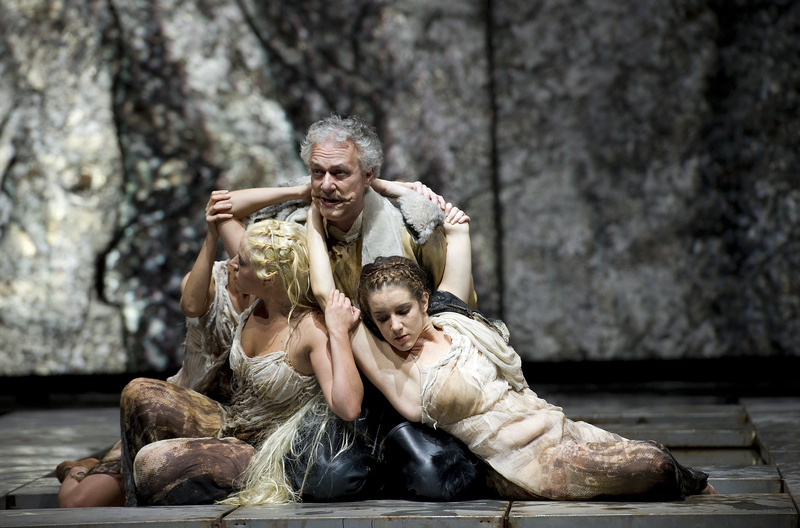 The Ring itself in this production is a sparkling glove, and when Alberich loses it the end of his arm appears cut off. The glove idea has the merit of making the Ring obviously visible to the whole audience, and when Wotan heeded Erda’s warning he gave it up by simply tossing it over his head. Costumes by Tim Van Steenbergen put the giants in dark suits, and the representation of the male gods reminded me of some rather odd dictators (the late Kim Jong Il came to mind in the person of Donner), and British readers will know what I mean if compare the appearance of Loge to violinist Nigel Kennedy. Good lighting by Enrico Bagnoli, who collaborated with director Guy Cassiers on the sets, and I liked the video projections that at one point seemed to suggest a future world. Their reflection on the water was very effective, but I gather from friends that this was not visible from all parts of the auditorium. This performance was on April 4. Die Walküre continues tonight on April 5, unencumbered by dancers if my memory of La Scala serves me right. This entry was posted on 5 April, 2013 at 11:26 and is filed under Opera, Wagner. You can follow any responses to this entry through the RSS 2.0 feed. You can leave a response, or trackback from your own site. I saw this production at La Scala and frankly the ‘dancers’ completely ruined the production for me. They are on stage continually from scene two onwards getting in everyone’s way and completely distracting attention away from the singers. In fact so distracting are they that they take your attention away from the musical performance. Why they haven’t been consigned to the scrapheap so the singers can have full attention I have no idea. I loved the performance but agree that the dancers are completely superfluous. Also I felt for Donner as he only has one big moment for which he completely fluffed the entry and had to miss out a phrase to get back on track. Such a pity as he had a pretty good voice. Is this a first? Last night, a man diagonally in front of my row in the balcony was reading the Siegfried libretto on his iPad during the second act. He looked hurt and surprised when I asked him to turn it off for the last act. The reflected light from the computer and its turning pages were distracting and ruined the performance for me and several of my neighbours. There were German subtitles anyway, so why did he need to use his iPad? I hope I’ll never come across this problem again. This must have been the Siegfried performance on 18 April. I would have objected at the time, but I suppose you were too far away to tap him on the shoulder. It seems the ushers were not doing their job!